I love books and I have two little book worms. We love reading together and my kids love taking their books to “read” to their toys. I am lucky my kids love reading non-fiction/ learning books as much as story books. I want to state I do not work for Usborne in any form my kids and I are just fans of their books. Usborne Thousands things to spot is one of our favourites. It is much cheaper to buy the big thousands things to spot then the individual books. These books are great as they teach the kids so many things without them even realising that they are learning. They have to learn to search for the items, they practice their counting and they improve their general knowledge not to mention their vocab. My kids have been through the insect section / under the sea section / towns section / farm section and then there is still all the fantasy sections (pirates / fairies / monsters). 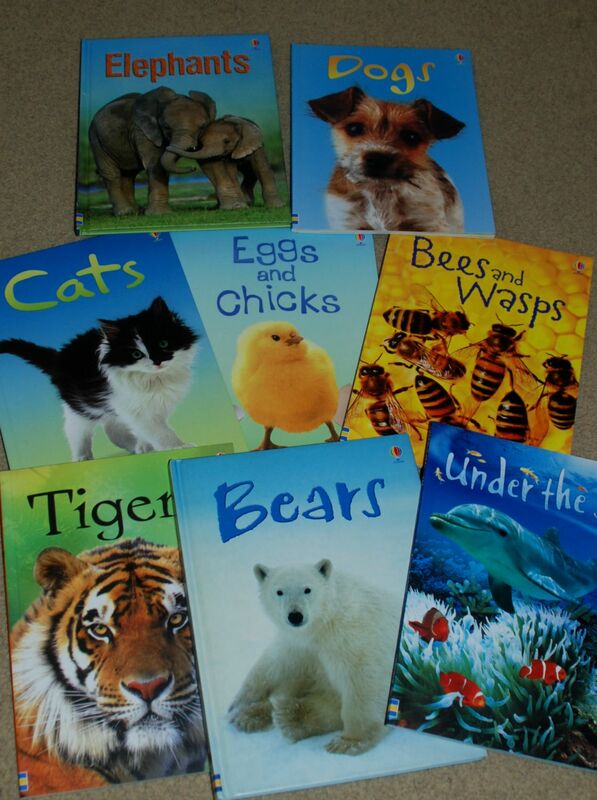 We also adore the Usborne Beginners books, we have over 20 of these books. the most popular are definately the animal ones – penguins / elephants /bears / eggs and chicks and I could go on and on. So far we have not bought one of these which we do not love and end up reading over and over again. Usborne look inside science is one of those books which we borrowed at the library and after renewing it for as long as we could we ended up buying it. It is a great book for key stage 1 science, it covers different materials, introduction to plants, our bodies, the solar system. Both my kids love to just page through the book by themselves and they will often go and fetch it when we are reading our stories. We also love the Usborne sticker books, we have done a number of these. Pink loves all the Dolly sticker books but the one that was a really big hit was the Around the World : Sticker Dolly Dressing this was great for starting conversations about different places, different people and even some different traditions. Blue has also done the Usborne Farm and the Digger sticker books and he loved these. I am also a huge fan of many of the Julia Donaldson books. I have found these are a great starting point for some learning topics and I love the rhymes. Both my kids love her books. In our house the most popular are : the Gruffalo, Room on the Broom, Monkey Puzzle, Stick Man, Superworm, The snail and the whale, Tiddler and Sharing a Shell. If you have never read one of these do yourself and your kids a favor and get one from your local library, we will not be disappointed. This entry was posted in Book Ideas, ks1 English, Science Ideas and tagged homeschooling, julia donaldson, Usborne books. Bookmark the permalink.